My hopes for Hula Hula were not high, but I’m so happy to hear that the local Seattle tikiphiles have made a couple visits to Hula Hula, and they like the place a lot. It sounds like some changes are coming to the drink recipes, and it looks like the place is darker and moodier than the Hula Hula website would suggest — and you regular readers know what a sucker I am for a dark bar. The music selections still sound incongruous to the decor, but as mentioned earlier, booking Lushy to play a show there is a huge step in the right direction. The local tikiphiles are planning on meeting up there the third Thursday of every month, with the first get-together happening on February 15. If you live in the area and would like to get to know other tiki-lovin’ people, I can personally vouch for them — the Seattle tikiphiles are near & dear to my heart. 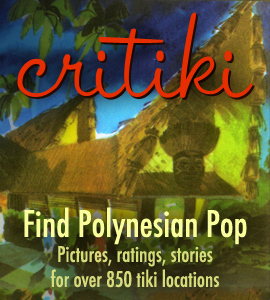 Perhaps Hula Hula will play some Exotica or some old hapa haole music for them on those days? Or better yet, hire Selector Lopaka to lend them a hand with the music! There are some pictures of a recent Tiki Central gathering at Hula Hula here, along with some of their reviews of the place. I have no idea what the glass bananas are about. Next Next post: My Travels: I’m Tiki-Ti Bound!